SVU AP Ed.CET Answer Key 2015 and AP Education Common Entrance Test 2015 Question Paper Sri Venkateshwara University AP Ed.CET 2015 Answer Key. Sri Venkateswara University (SVU) conducted the AP EdCET 2015 on 28 May 2015 (Thursday) 11:00 AM to 1:00 PM on behalf of APSCHE. We are here providing the SVU AP Ed.CET Answer Key 2015 & Question Paper. All AP Ed.CET Paper Code A, Paper Code B, Paper Code C Paper Code D Answer keys were available here for download. 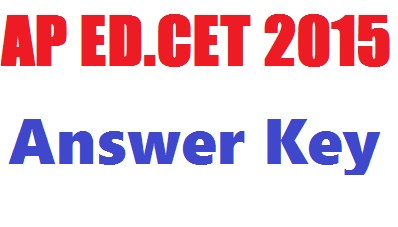 www.apedcet.org, AP Ed.CET Answer Key 2015 Download. Sri Venkateswara University, Tirupati on behalf of Andhra Pradesh State Council of Higher Education invited eligible and deserved candidates who possess 50% marks in bachelors or masters degree in the relevant subject or any other equivalent subject to take ADCET 2015 exam. AP EDCET examination will be conducted by APSCHE for giving admission for eligible candidates through Ed.CET 2015 ranks for B.Ed special education in Sri Venkateswara University. Chairman of Ed.CET 2015 while speaking to media said that this year examination is going to be held on May 28th, 2015 across Andhra Pradesh in 42 towns/cities in 349 examination centers. Around 1.6 lakhs of candidates applied for AP EDCET examination which is re scheduled to be held on May 28th at 11:00 AM to 01:00 PM. Examination question paper will be available in two languages say English and Telugu which is loaded with 150 questions from General English, General Knowledge, Teaching Aptitude and Methodology. Convenor said that candidates need to download ECET hall ticket rank cards from the official website only. After examination candidates can download AP Ed.CET 2015 Answer key here after 06:00 PM. Candidates will be given admission for B.Ed courses in Andhra University based on the ranks obtained and the ranks will be given in the following way. Candidates will be given ranks based on the marks obtained in Ed.CET 2015 examination where there is a tie in total marks them Part-c marks will be considered in case of further tie Part A will be taken into account for awarding ranks. Rank obtained in Ed.CET examination will be valid only for this academic year 2015-16. After completion of EDCET examination some of the educational portals like eenadupratibha.net and sakshieducation.com will provide answer keys along with question papers. Candidates will be very anxious to know about their marks to estimate the rank hence with a view to help you we will update the direct link for checking your answers. According to convener the answer keys will be hosted in official website after 06:00 PM. Be tuned to our site for more information regarding AP EDCET 2015 Answer Keys, Results and Rank cards download.